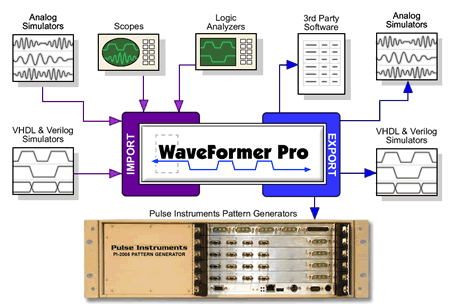 WaveFormer Pro and TestBencher Pro generate stimulus files for Pulse Instruments PI-2005 Pattern Generator. Programming a pattern generator with enough stimulus to adequately exercise a hardware prototype has traditionally been a very labor intensive and error prone process. SynaptiCAD's WaveFormer Pro eliminates this problem by allowing the reuse of waveforms from the simulation phase to serve as the waveform stimulus. WaveFormer also has a built in timing diagram editor that lets you create and edit the pattern generator stimulus. 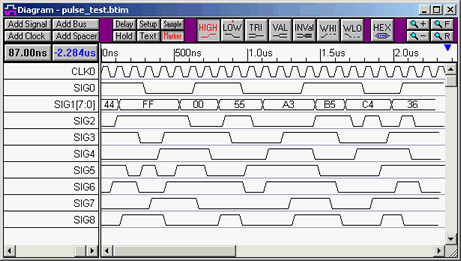 WaveFormer exports the waveforms as displayed in the timing diagram window. TestBencher supports repeat loop markers that will cause a section of the waveform data to be repeated by the pattern generator. In addition to direct translation, WaveFormer can generate stimulus waveforms using a combination of graphically drawn signals, timing parameters that constrain waveform edges, clock signals, and temporal and Boolean equations for describing complex, quasi-repetitive signal behavior. Advanced operations on signals such as time scaling and shifting, and block copy and pasting of signal behavior over an interval of time are also supported. This simple, but powerful environment dramatically eases the labor associate with the generation of complex stimulus. The resulting hardware test benches also have the same functional coverage of the simulation models ensuring that the hardware prototype is adequately tested. WaveFormer Pro and TestBencher use a timing diagram define the waveforms for export. Waveforms can be imported from simulation files or drawn in the timing diagram editor. Each timing diagram should contain one clock. The positive edges of the clock will be used as the sampling points for rest of the waveforms. The period of the clock will be output to the PERIOD statement in the PI-2005 file. By default, WaveFormer will use the first clock in the timing diagram as the sampling signal. If you import waveforms from a simulation file you will need to either add a clock or convert the clocking signal to a SynaptiCAD clock by right clicking on the signal name and choosing Signal <=> Clock from the context menu. The PI-2005 requires that waveform values be only 0's and 1's. So the export script converts non-binary waveform values like tri-state into 1's during the export. Also the PI-2005 only supports time units of NS, US, and MS for the PERIOD statement. This means that the display time unit for the timing diagram should be set to one these three values. Data is loaded serially one channel at a time into the PI-2005. The signals in the timing diagram are mapped to the channels in the PI-2005 using the Edit Pod Properties dialog. PI-2005 channels start with #1 and use Pod0. 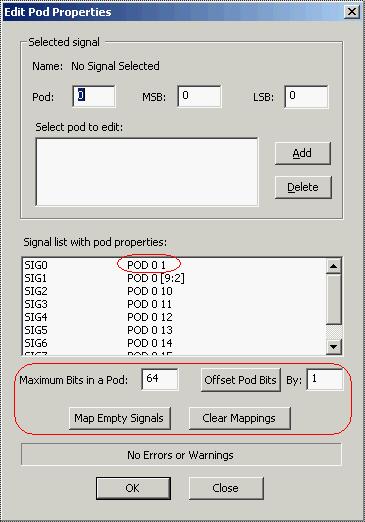 You must setup Pod0 so that the maximum pod bits is 64 and the offset is 1. TestBencher supports repeat loop markers in the export of PI-2005 data. Each repeat loop defines a subpattern in PI-2005 file. The smallest subpattern supported by the instrument is 20 clock units long, so each repeat loop should span at least 20 clock pulses. Repeat loops are ignored by WaveFormer Pro. In WaveFormer or TestBencher, either load in a simulation file or create a timing diagram. Each timing diagram must have a clock signal that will be used as the sampling clock. At each rising edge of the clock, the states of each signal will be written out to the pattern generator file. The first clock in the timing diagram will be assumed to be the sampling clock, all other clocks will be ignored. To draw the above diagram, press the Add Clock and Add Signal buttons to add the clock and signals. Grid lines can be added to the clock by double clicking on the clock name to open a clock properties dialog, press the Grid Lines button to open the grid dialog, and then check the Enable Grid Lines check box. If you have imported a simulation file you must mark one signal as the clock. Right click on the signals name can choose Signals <=> Clock from the context menu. Choose Export > Edit Pods menu to open the Edit Pods dialog and set the maximun pod bits to 64 and the offset to 1. Press the three buttons in this order, Clear Mappings, Map Empty Signals, and Offset Pod Bits. Check to make sure that the first signal mapping is on POD0 and Channel 1. All the other signals should be mapped to POD0. Choose the Export > Export Timing Diagram As menu option to open the file dialog. Choose PI-2005 Pattern Generator from the file type drop-down list box. The resulting text file is a series of GPIB commands that can be read directly by the PI-2005 pattern generator. Contact Pulse Instruments, support@pulseinstruments.com, for details on custom application development and working directly with the instrument. The exported text file can also be imported into the PI-PAT control software. In the PI-PAT software, create a new PI-2005 document via File > New. Choose File > Import File menu and select the exported text file. Once the pattern file has been imported, PI-PAT may then be used to control the pattern generator and to edit the waveform patterns.